I'm fascinated, as was my father, by how technology changes the world around us. I've decided to use this blog to discuss. Here for instance, from the attic, is the typewriter that I used to write my high school papers. It's a Smith Corona. There's a printer ribbon which can set to type in red. I suppose eraser ribbons might have also existed for this type of typewriter although I never had one. To erase, I used either an eraser (if I was using erasable paper) or white tape. The return key that you see on the computer keyboards is an echo of how we use to hit the silver return bar at the end of the line. The next generation electronic typewriters, which I used in college, had a Return Key. I graduated from high school in 1976. The hands in this picture are those of my daughter who thought this was really cool. 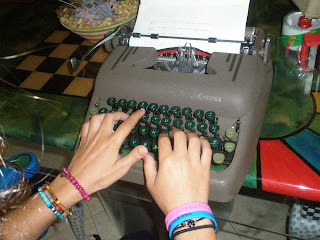 The kids love the typewriter. And when I showed them carbon paper (which is the next post), they really thought it was cool. In some related posts, did you know that carbon paper is cool and that while it's still available in Office Depot, most kids have never seen or used it? 1. Comment here on how you learned to type. I personally took a summer school typing course before junior year in high school. 2. Facebook share, tweet about it, or write a short post in a blog or forum. Thanks, I could use the support.